I love the idea of year round school, taking breaks when you want or need them, but that just doesn’t work for us. Turns out, when the dad runs a summer camp, life is crazy during summer (even when that camp is only two weeks as compared to ten in previous years). BUT… this year I have been able to sneak in school. And the kids don’t even realize it. I have really been wanting to encourage more game playing with our family (and less computer time and movies), so when I saw Timeline shared on Facebook, I immediately checked it out on Amazon. Wouldn’t ya know that it was not only a fun game, but it would help in a weak area for my kiddos: date memorizing. I clicked order and two days later we had played it four times in one afternoon. It’s a quick game (a plus in my book). The kids know better than to ask me to play Monopoly. It’s not a strategy game (another plus in my book, for me… because I stink at strategy games, no matter how much I want the children to be good at them). Everyone in our family can play it, with a partner or without (definitely a plus for a large family). 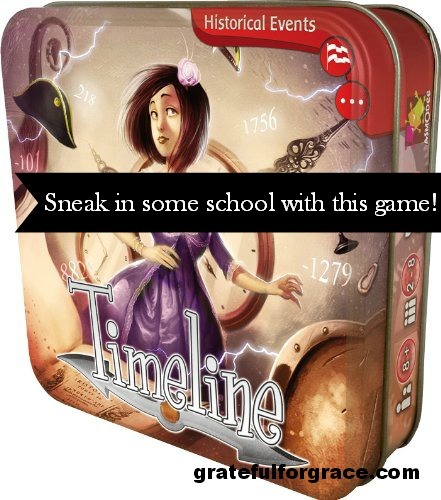 It teaches dates of important events in a fun way (a plus for our homeschooling). I see two negatives for the game. One is that once you’ve played it six times or so, you’ve used all the cards. That’s not so horrible in that you then start to memorize the dates for the historical events you didn’t know, but… I fear it may get old in a few more days if we keep playing non stop. Though, if I was a betting woman, I’d bet that my kids will enjoy playing it with “newbies” now since they will have the advantage of memorizing the dates. Also, the idea is to memorize the dates, so doing so eventually is really not that big of a negative, right? The other con for the game is if you are a young earth creationist, five of the 110 cards in the Historical Events version won’t match up to the dates (I’m not sure about other versions). We just changed the dates on the cards with sharpies, though. No big deal. 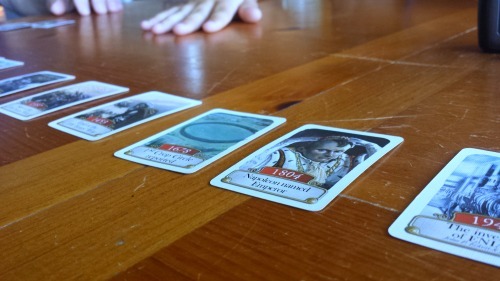 We started with Timeline: Historical Dates, but now I’m going to order another version of the game so that we have more dates memorized by the end of the summer! I’ve ordered Timeline: Diversity (not what it sounds like, but more of a hodge podge of information). There is also Timeline, Timeline: Music & Cinema, and Timeline: Discoveries. I really do want them all. 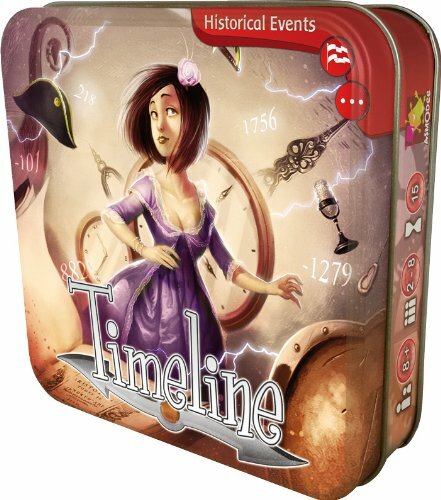 Have you heard of or played Timeline?